Badges? Certificates? What counts as succeeding in MOOCs? Oops, I did it again. I’ve now managed to complete another MOOC. Bringing my completion rate of to a grand total of 3 (the non completion number is quite a bit higher but more on that later). And I now have 6 badges from #oldsmooc and a certificate (or “statement of accomplishment”) from Coursera. But what do they actually mean? How, if ever, will/can I use these newly gained “achievements”? Success and how it is measured continues to be one of the “known unknowns” for MOOCs. Debate (hype) on success is heightened by the now recognised and recorded high drop out rates. If “only” 3,000 registered users complete a MOOC then it must be failing, mustn’t it? If you don’t get the certificate/badge/whatever then you have failed. Well in one sense that might be true – if you take completion to equate with success. For a movement that is supposed to be revolutionising the (HE) system, the initial metrics some of the big xMOOCs are measuring and being measured by are pretty traditional. Some of the best known success of recent years have been college “drop outs’, so why not embrace that difference and the flexibility that MOOCs offer learners? Well possibly because doing really new things and introducing new educational metrics is hard and even harder to sell to venture capitalists, who don’t really understand what is “broken” with education. Even for those who supposedly do understand education e.g. governments find any change to educational metrics (and in particular assessments) really hard to implement. In the UK we have recent examples of this with Michael Gove’s proposed changes to GSCEs and in Scotland the introduction of the Curriculum for Excellence has been a pretty fraught affair over the last five years. At the recent #unitemooc seminar at Newcastle, Suzanne Hardy told us how “empowered” she felt by not submitting a final digital artefact for assessment. I suspect she was not alone. Suzanne is confident enough in her own ability not to need a certificate to validate her experience of participating in the course. Again I suspect she is not alone. From my own experience I have found it incredibly liberating to be able to sign up for courses at no risk (cost) and then equally have no guilt about dropping out. It would mark a significant sea change if there was widespread recognition that not completing a course didn’t automatically equate with failure. I’ve spoken to a number of people in recent weeks about their experiences of #oldsmooc and #edcmooc and many of them have in their own words “given up”. But as discussion has gone on it is apparent that they have all gained something from even cursory participation either in terms of their own thinking about possible involvement in running a MOOC like course, or about realising that although MOOCs are free there is still the same time commitment required as with a paid course. Of course I am very fortunate that I work and mix with a pretty well educated bunch of people, who are in the main part really interested in education, and are all well educated with all the recognised achievements of a traditional education. They are also digital literate and confident enough to navigate through the massive online social element of MOOCs, and they probably don’t need any more validation of their educational worth. But what about everyone else? 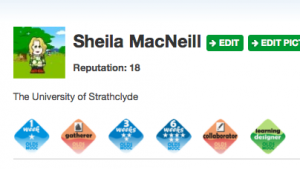 How do you start to make sense of the badges, certificates you may or may not collect? How can you control the way that you show these to potential employers/Universities as part of any application? Will they mean anything to those not familiar with MOOCs – which is actually the vast majority of the population. I know there are some developments in California in terms of trying to get some MOOCs accredited into the formal education system – but it’s very early stages. Again based on my own experience, I was quite strategic in terms of the #edcmooc, I wrote a reflective blog post for each week which I was then able to incorporate into my final artefact. But actually the blog posts were of much more value to me than the final submission or indeed the certificate (tho I do like the spacemen). I have seem an upward trend in my readership, and more importantly I have had lots of comments, and ping backs. I’ve been able to combine the experience with my own practice. Again I’m very fortunate in being able to do this. In so many ways my blog is my portfolio. Which brings me a very convoluted way to my point in this post. All this MOOC-ery has really started me thinking about e-portfolios. I don’t want to use the default Coursera profile page (partly because it does show the course I have taken and “not received a certificate” for) but more importantly it doesn’t allow me to incorporate other non Coursera courses, or my newly acquired badges. I want to control how I present myself. This relates quite a lot to some of the thoughts I’ve had about using Cloudworks and my own educational data. Ultimately I think what I’ve been alluding to there is also the development of a user controlled e-portfolio. So I’m off to think a bit more about that for the #lak13 MOOC. Then Lorna Campbell is going to start my MOOC de-programming schedule. I hope to be MOOC free by Christmas. Stage two of my “adventures in MOOC-land” started this week as the e-Learning and Digital Cultures course started this week. I have signed up for Coursera courses before but for various reasons, I haven’t got very far. However I have a lot more motivation for sticking with this course. For the past couple of years I have toyed with applying for the Masters in Digital Education at Edinburgh so this seems like a good way to get a taster for that course, and also a change to “compare and contrast” what is now being referred to by the Mooc-gnoscenti as a “x-MOOC” (the US big ones! ), and the #oldsmooc which is more in the “c-MOOC”(connected/community) or even the p-mooc (project) camp. The final assessment is the creation of a digital artefact which will be peer assessed. Contributing to online discussions is encouraged but not mandatory. There has been a huge amount of blogging activity already and in terms of openness it is great to see that the collated #edcmooc tagged blogs are openly available. The first block of the course centres on utopian and dystopian perspectives of digital culture and digital education and how these views impact our own practices as learners, students and teachers. Week one has looked to the past in terms of highlighting both sides of the fence. Currently MOOCs themselves are one of the best examples I can think of in relation to utopian and dystopian visions for education and technology. I’ve collated some of the responses to this tweet in this storify. Every week in the mainstream, technology and education press there is at least one post claiming that the education system is broken and more often than not MOOCs are being heralded as the “thing” to save the system. Particularly as Coursera, Udacity etc have been able to raise vast sums of capital, and enroll hundreds and thousands of students, which can only be a good thing, right? Looking to the past isn’t this massive engagement (on a global scale) what we need to do to address the education imbalance? But are MOOCs really a stable and sustainable way of addressing this? There are are various flavours of “openness” in MOOCs. Increasingly as the business side of thing kicks in and investors want to see ROI charges are being brought in for the bit that really counts – assessment. Will as many people who signed up for the courses this year be able and willing to pay in subsequent years? If they don’t what then? I have yet to see any MOOC business model that isn’t predicated on paying for assessment – so where’s the change to the system there? When can/ will MOOCs break even? In the UK we are still waiting to see exactly what FutureLearn (the OU UK driven MOOC platform) will offer. I’ve seen mentions of it “exciting” “learner focused” etc, but what will that look like? Do we really need another “platform” ? What will distinguish it from other VLEs? I can’t really see why any university needs to sign up to a mooc platform – they already have what they need in their VLE, and other technologies that are out there. Perhaps it more a case of having to be seen to be “playing the game” or being “in with the in-crowd”. Past experience should tell us that isn’t always the best place to be. Tony Hirst wrote a really insightful post on the possible development opportunities for FutureLearn early this week, and I noticed another one last night which brings in some more thinking and links to other possible models. I suspect tho’ the real reason is the dystopian vendor/commercial lock down one. Recognise this? It’s actually about the early days of WebCT but could quit equally be used in the MOOC context. Plus ça change, plus c’est la même chose. I can’t help feeling that the utopian ideals of MOOCs (open, massive, connected, community based) are getting squished by the venture capitalists, the existing ‘systems’ who are just going to repackage what we’ve already got in a slightly different way but if they keep telling us the system is broken we’ll have no option but to buy into their (dystopian) solution, which still equates “quality” with payment. There’s already been some backlash to the peer assessment being used in some MOOCs. Is there an implicit encouragement of gaming the system ben encouraged in #edcmooc when were told we don’t have to contribute to discussion etc by online activity might help when it comes to the final assessment? The more you engage the more like it is that someone will review your assessment? So are the models being used really scale up to and incorporate some of the more visionary thinking around peer assessment? Some of the new “platforms” are turning to analytics for “excitement” and “insight”, but based on what, the data that is easiest to display – which is usually assessment data. I have a sneaky suspicion that will be monetized sooner rather than later. The more you want to know about your interactions, the more you’ll have to pay for those little nuggets of insight into your own behaviour. And are the big MOOCs (like #edcmooc) really reaching out to a substantially different student cohort? I’ve already commented about digital literacy (proficiency in English) and overall confidence a learner needs gain meaningful inter-actions in a massive context. Every time I log into Coursera I’m reminded of my foolishness of thinking that I could cope with their natural language processing course. Of course, there was no cost – so not a lot of loss for me in that case. Most of the MOOCs I know about are aimed at pretty well educated people – not the really dis-engaged or disadvantaged and the ones who don’t just need a “nice video” but some real face to face support. Open content initiatives such as OpenLearn can (and are) helping to do that. But MOOCs not so much – yes there are some examples of “flipped classrooms” but most in HE are again with the students who are getting the grades, not the ones struggling to get into college. Wouldn’t it be nice if more of venture capitalist and Universities spent even a third of what they do on “systems” on staff development and enhancing face to face teaching? As John Daniels points out effective education combines people and technology. Right now as a learner what I really want is a space (not a system) where I can create, connect and share my learning and activities. That’s why I have been really excited by the potential of representation of networked views of Cloudworks. The visualisations created by Tony give me hope that there is hope and that change can be driven from the educator/leaner point of view and not the vendor. My dreams of utopia are still alive. Daniel, J. (2002). Technology is the Answer: What was the Question? Speech from Higher Education in the Middle East and North Africa, Paris, Institut du Monde Arabe, 27-29 May 2002. Noble. D. (1998). Digital Diploma Mills: The Automation of Higher Education. First Monday 3/1.